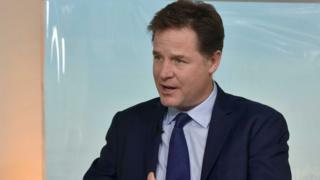 Former Liberal Democrat leader Nick Clegg says people should consider joining Labour in an attempt to prevent Brexit from happening. In his new book, Mr Clegg said it was “a time of national emergency” and he told people worried about Brexit to “make your voice heard”. He also said joining the Conservatives was “another route to make your views felt”. Mr Clegg, the former deputy PM, lost his seat in June’s general election. He has remained an outspoken critic of the UK’s departure from the EU, and his new book is called “How to stop Brexit”. In it, he says it “may seem odd” for a former Lib Dem leader to be advocating joining Labour, adding that he himself would not be doing so. “But if you are someone who has never joined a party, or perhaps has been inclined to join Labour but has never got round to it, or if you are simply someone who recognises that the importance of Brexit is far greater than individual,” he writes.